The pines are calling; this 10 acre ranchette features a large ranch-style home with walk-out basement surrounded by whispering pine trees. 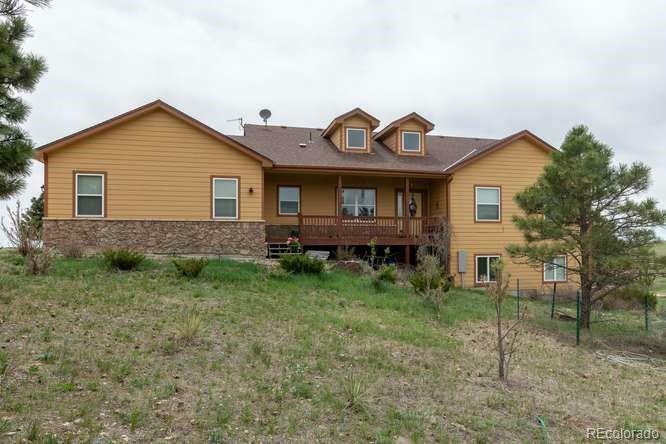 Enjoy privacy while you live your country dream just East of Elbert or South of Kiowa. Large home has terrific upgrades. Large open concept kitchen features granite counters, lots of cupboards and hard wood floors. Formal dining room space plus breakfast nook. Cozy master bedroom with gorgeous master bath suite, walk-in closet and private access to the deck. Basement is finished into a large family room, bedrooms, nice full bathroom and storage space. 3 car attached garage. Bring the critters, this little hobby farm has a chicken coop, small livestock barn and the fencing stays. Gate entry system for security gives you peace of mind when home or away. Beautiful acreage with mature pine trees; all to be enjoyed from the front porch or the large deck off the back of the home. Definitely worth the easy drive down county maintained roads, come see!